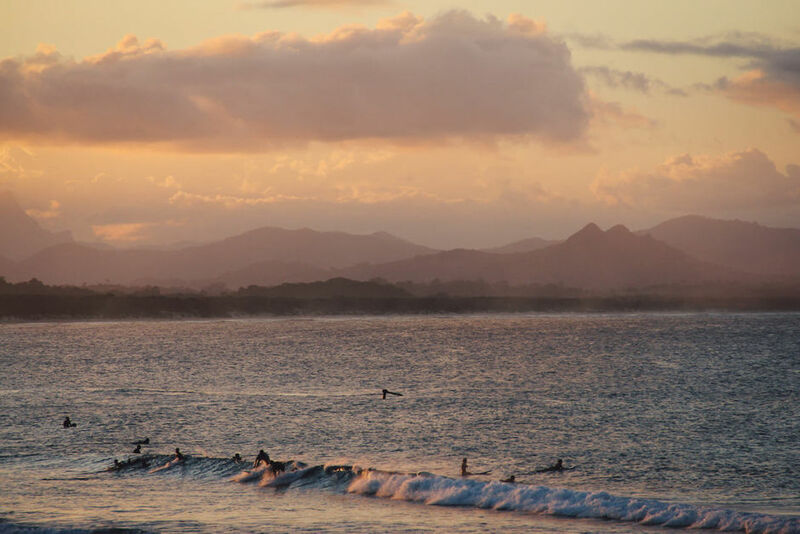 Byron Bay, home of the Arakwal people, is traditionally known as Cavvanbah, which translates to “meeting place.” This former whaling town in New South Wales, Australia, has lived up to that name since surfers discovered the abundance of rideable waves. 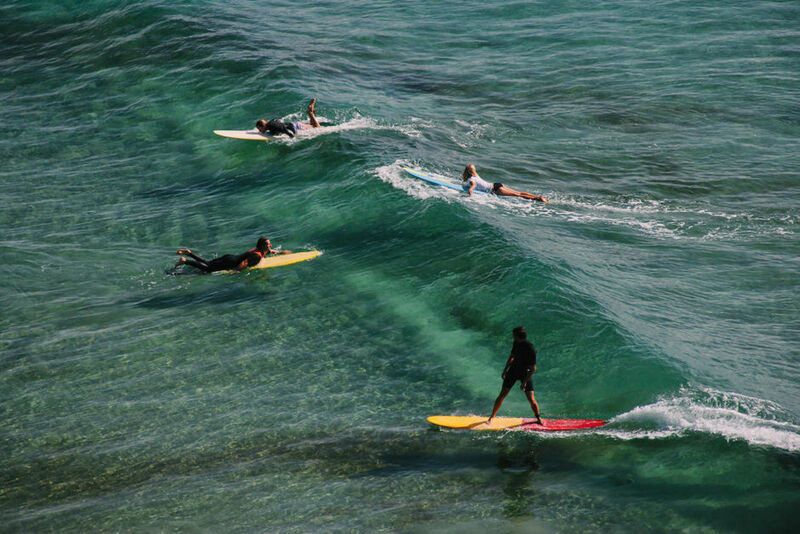 Following the surfers came the hippies, yogis, artists, musicians — pretty much anyone who wants to live an alternative lifestyle — and thus Byron has become a hub of counterculture and alternative lifestyles. This, combined with the area’s beauty, is why #VanLife is so popular here. This is exactly why my husband and I came here. 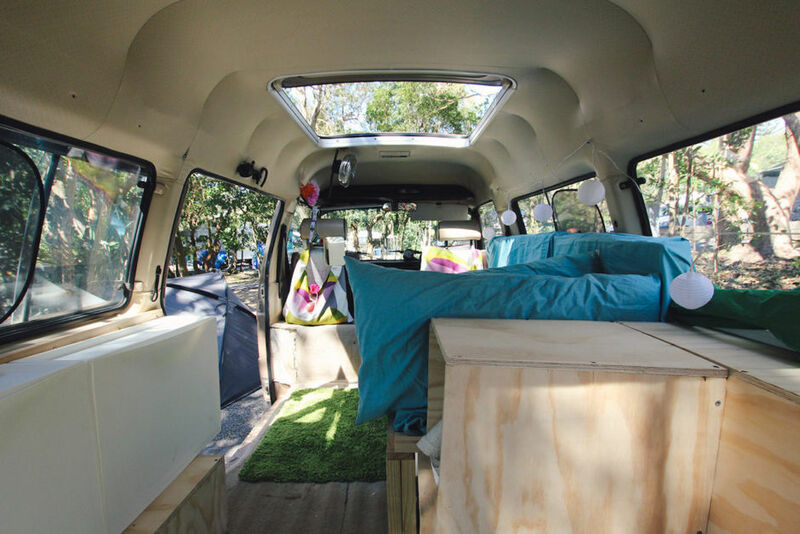 We’ve always loved the freedom and minimalism that comes with living a life on wheels. 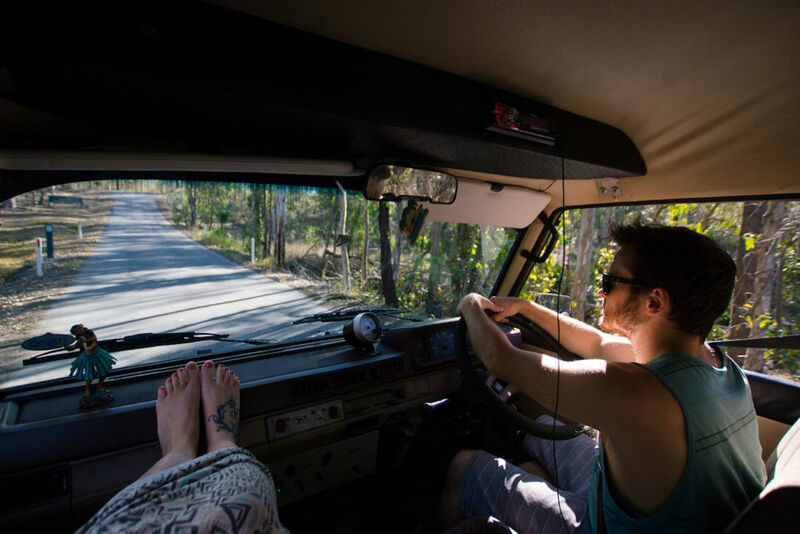 We found that housing was nearly impossible to find in Byron Bay anyway, so we decided to go for it: we bought a little home on wheels and rolled on down to Byron to live the ultimate van-life adventure. If you’re a free spirit as well, you’re probably going to want to park right next to us. Byron Bay is crazy popular. It was formerly a sleepy industrial town serving whalers and dairy farmers, but both industries came to a halt when whaling was outlawed and dairy started getting mass produced. Then, with the rise of surfing in the 1960s and the introduction of a far-out festival aptly named the Age of Aquarius in nearby Nimbin, a hippie-surfer commune was born. It was pretty quiet for awhile, but as backpacking picked up and long-haul flights became more affordable, Byron took off in the ‘90s and exploded by the early ‘00s. As such, the beaches, streets, stores, and campgrounds are always full of people. We could often only get a few nights here or there at any given campground. Sites can range anywhere from $15 a night with basic facilities to $50 a night for a powered site at a full-service campground. But the good news is that there are a lot of options, and they all offer something different - from the semi-stoned backpacker hub of The Arts Factory to the essentials of Belongil Fields or the refreshing cleanliness of Reflections Holiday Park, there is always a place to call home for the night. We picked up our rad Delica Starwagon - named after it’s sun/moon roof, which retracts for stargazing - in Brisbane. 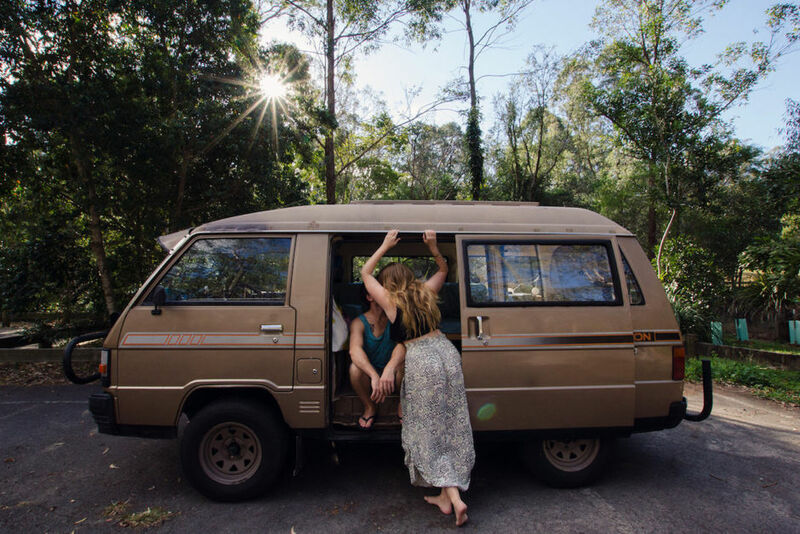 We fixed her up and outfitted her in a friend's garage, fueled up, and hit the highway, heading south to Byron Bay. We were sure to take it slow on arrival - we didn’t want to break any rules or cause trouble with our van. 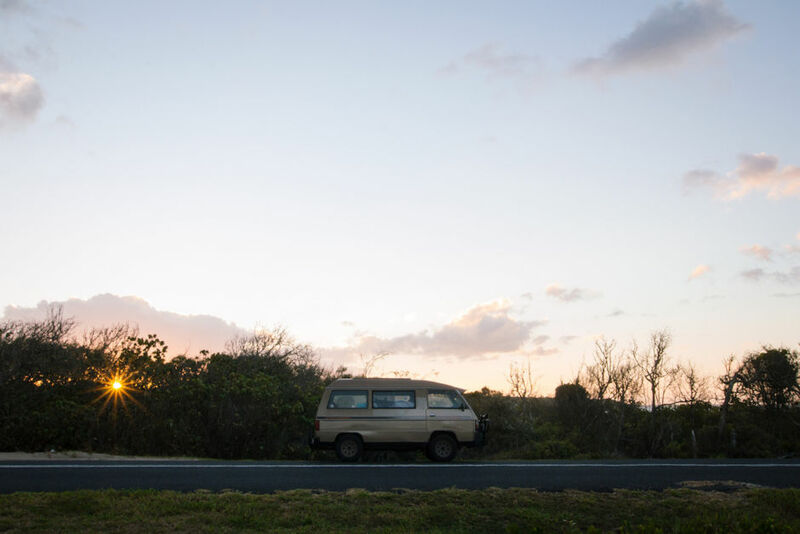 A good tip is to find other van-lifers and ask for insights into staying in the area. Once we started to feel settled, we began to explore. We learned quickly that the lighthouse is a literal beacon for the community. 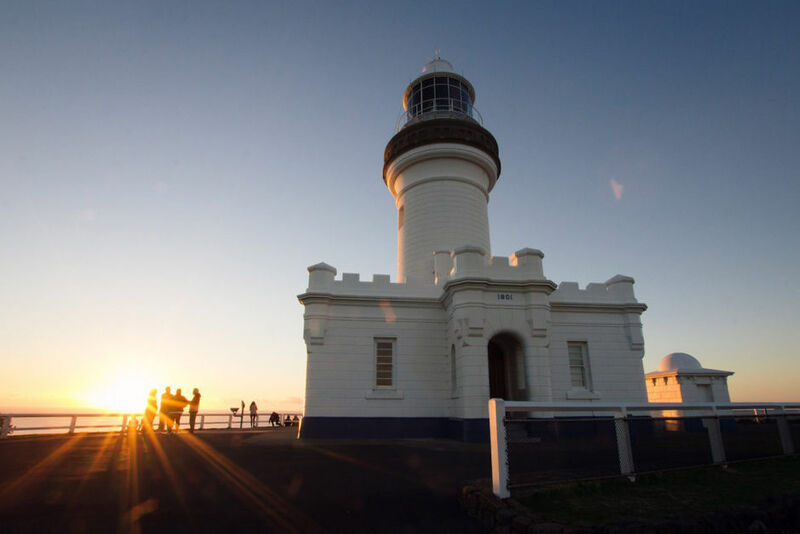 There are always people here running the surrounding trails or using the lighthouse as a base from which to watch the spectacular sunrise over the most eastern tip of Australia. Normally, for me, the effort to watch a sunrise is too great, but one perk of living out of a van was that we could sleep nearby (or a few minutes drive) and simply roll out of bed at dawn to watch the sunrise along the boardwalk. We’d grab coffees at the best cafe in town, Top Shop, and soak in the morning’s quiet and colors. The Julian Rocks are some very distinguishable rocks that can be seen from the shore. The site is a marine reserve, so the aquatic life is abundant. 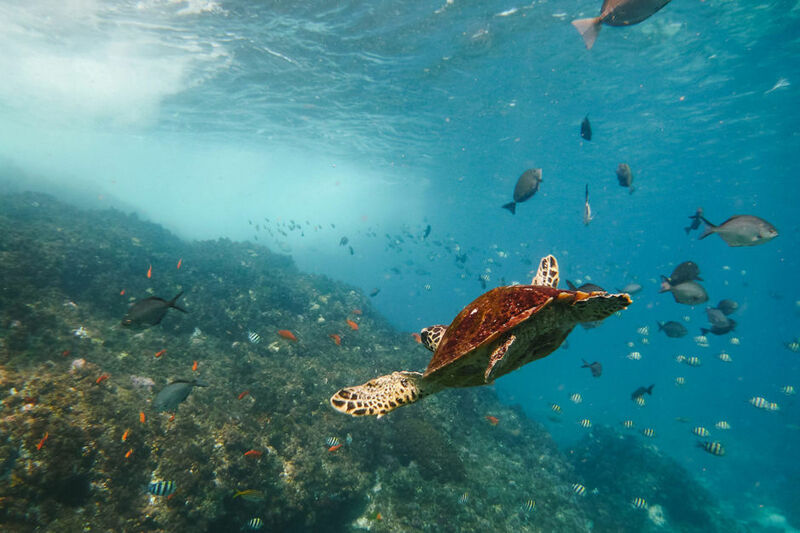 Depending on the time of year, people can swim with turtles, dive with manta rays, listen to humpbacks sing, or have a staring contest with a leopard shark. I personally stuck with the turtles. We noticed early on that stores in town would randomly be closed despite their posted hours, with signs that read, “Back in an hour.” We realized this wasn’t random at all: it correlated perfectly with when the surf was really getting good. Having a home on wheels means you’re free to come and go as you please. 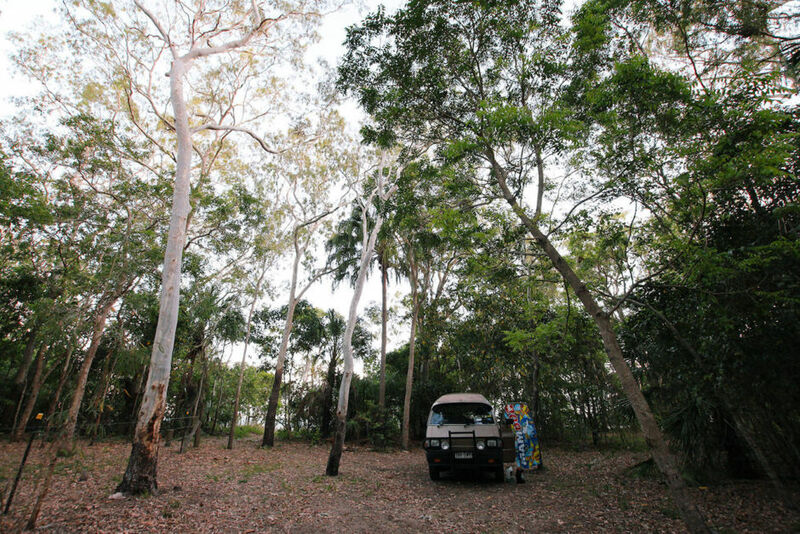 We’d often take off to explore the coast and hinterland during weekends and holidays when Byron was at its busiest. 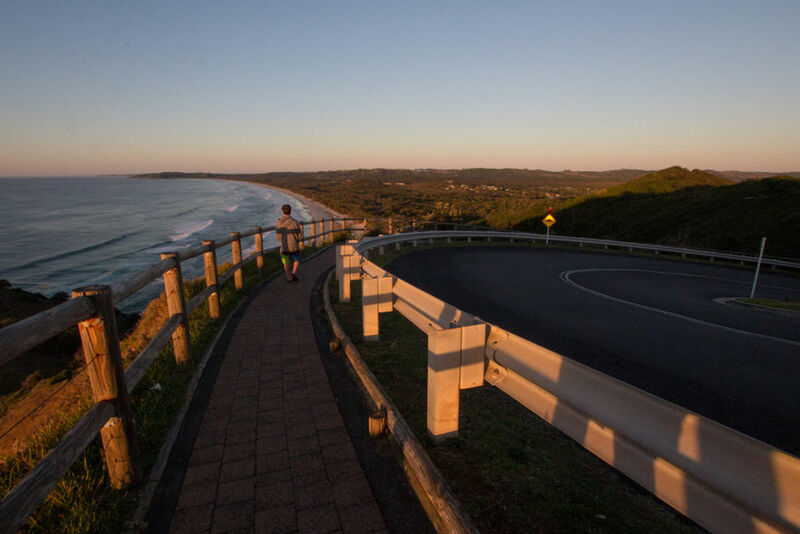 We didn’t have to go far to escape the crowds: Lennox Head, Ballina, Mullumbimby, and Brunswick Heads are all quieter (and more affordable) nearby options. We bought our van unconverted, so we were able to build it to suit us perfectly. We needed a bed, storage, workspace, and kitchen all in one tiny space. We built a bed on slats so we could have under-bed storage and also slide it into a couch/workspace. Flat shoe cabinets attached to the wall, and throw pillowcases on the back of the front seats made for easy access storage. We put the kitchen area in the back so we could pop open the trunk and cook standing up. And when we popped the sunroof at night to see the stars, well, that’s when it really felt like magic. An important part of van life anywhere is respecting the community, parking in designated areas, and disposing of waste properly. This is the real and unglamorous side of the lifestyle. Too often we saw people parking illegally for the night, being outrageously loud til the wee hours, and leaving garbage (or even human waste) behind. It can cause a lot of tension in the community and ruin the experience for others. So if you strike out and try van life on for size, do it - but do it right. Do your research and respect the community, the environment, and the rules that are in place. If you can do these, you’ll have a blast and avoid being a bother to anyone. 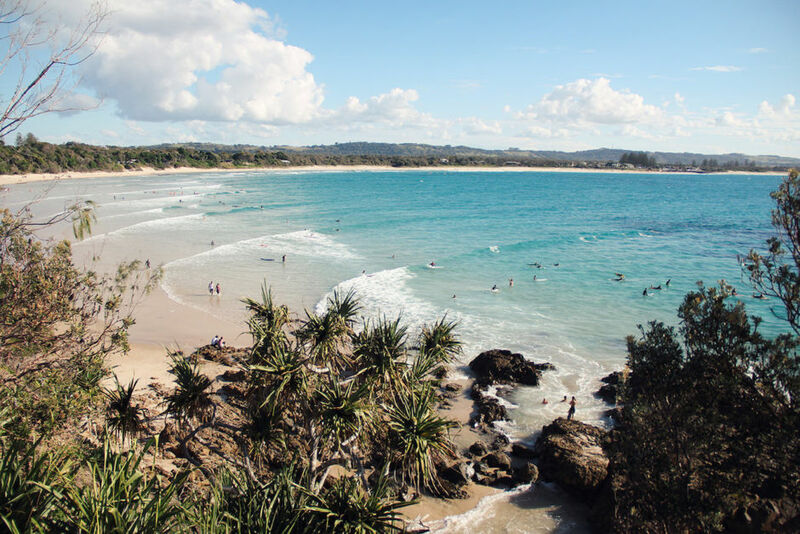 Byron Bay was our home base for a whole year. We explored the coast, inland and around, but continued returning back to this welcoming little town throughout the year. When our time was up, we sold our van to a freshly arrived couple looking for the same freedoms we were. We heard they were going to drive it across and up the west coast. Wherever Stargazer ended up, we hope she’s making someone else as happy as she -and Byron Bay - made us.